The agreement’s first milestone is the joint development of the automatic air-to-air refuelling (A3R) concept to increase operational efficiency by cutting the time for each contact. The Royal Australian Air Force (RAAF) and Airbus today signed a research agreement to further develop the RAAF KC-30A’s capabilities. The agreement strengthens the industrial partnership between Airbus and Australia’s defence force, and will help to define the evolution of the KC-30A fleet as it reaches operational maturity and expand its capabilities. This will result in the KC-30A’s core transport and refuelling capabilities supporting the RAAF’s transformation into a fully integrated force, capable of tackling complex contemporary defence and security challenges. The agreement’s first milestone is the joint development of the automatic air-to-air refuelling (A3R) concept, which represents a major step forward in in-flight refuelling. Automating boom refuelling contacts reduces potential risk by minimising operator workload, and increases operational efficiency by cutting the time for each contact.The system requires no additional equipment in the receiver aircraft. Initial approach and tracking of the receiver is performed manually from the A330 MRTT’s console. Once the image processing system acquires the receiver and the receptacle position, the operator can use the system aid allowing the boom to automatically follow the receptacle. Final extension of the boom’s telescopic beam is manually performed by its operator to make and maintain contact. 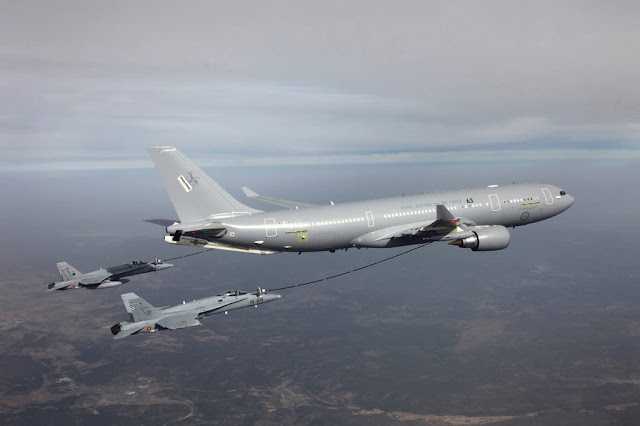 Fernando Alonso, Head of Military Aircraft at Airbus Defence and Space said: "The KC-30A offers tremendous combat potential at the heart of the integrated Air Force of the Future, including using the platform as a Communication Node, to maximise air power delivery." Air Marshal Leo Davies, Chief of Air Force, RAAF, highlighted the value of ongoing defence and industry collaboration. "We are delighted to contribute to the research and development of A3R with Airbus to automate the process for boom refuelling without the need for control by our on-board air refuelling operator", said Air Marshal Davies. The Royal Australian Air Force and Airbus have successfully performed proximity trials, with physical contacts planned for the near future.